Among some my very first followers, behind some the very first encouraring comments I received when I started blogging, there was Eugenia. We started blogging around the same period and I've always scrupulously followed her blog ever since; beyond her love for polish there's a deep love for English litterature and radiating kindness. When Sam asked if I would be interested in contributing to her guest blogger series, I was so pleased ...then I got nervous! What could I possibly show, that would do her amazing work justice?! I instead decided to step out of my comfort zone, which is usually straight up nail lacquer painting, and prepared a jazzed up version of a look. 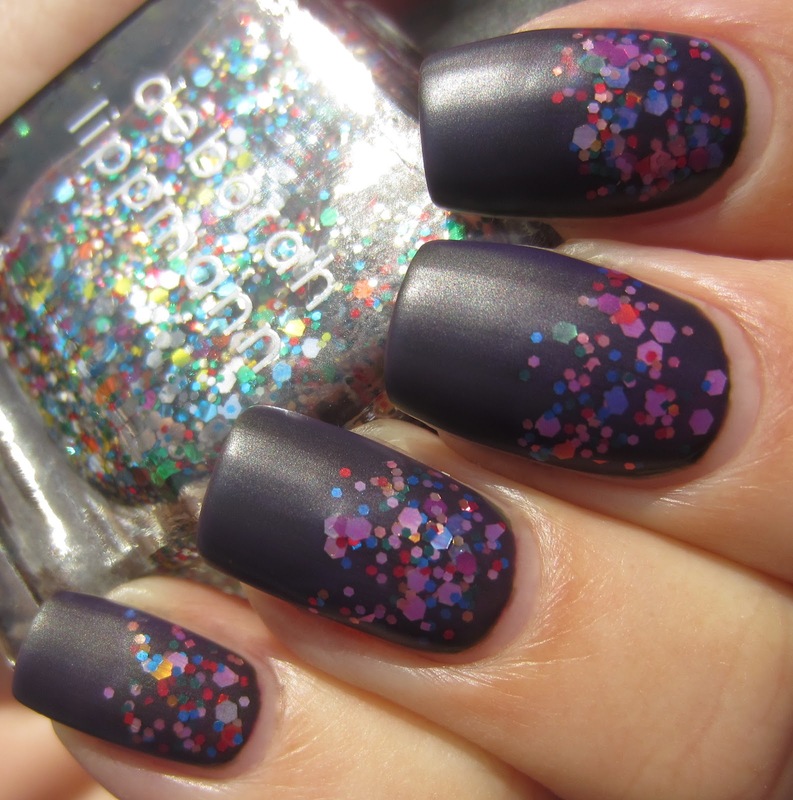 In honour of Sam having reached this incredible milestone, I wanted something celebratory to mark the event, but since there's no "Happy 2 million page views" nail varnish out there, I chose the next best thing: 'Happy Birthday' from Deborah Lippmann. After prepping my nails with Deborah's Rehydrating Base Coat, I then applied 2 coats of 'Billionaire' (not an impossible goal for Sam, by the way!) - a blackened green jelly hue. Over that I then added 2 coats of 'Happy Birthday' - a multi coloured, multi-sized glitter party in a bottle, but only to the top third of the nail from the cuticle line. A final coat of 'Call Me Irresponsible' - a vivid true purple jelly shade, was layered over this combination, and instantly transformed the original base shade, turning this into a unique glitter sandwich. Lastly, and in honour of Sam's preference for this finish, I took the entire deal one last step further by adding a mattifying top coat, which not only served to emphasize each individual glitter piece, but added a ridiculously buttery smooth overall feeling to it. My final verdict? I loved it so much that I wore this look for 3 days straight - an unheard of event for me! I want to thank Sam once more for including me in her celebrations and for the record, I want to say that I feel rather proprietary over her, as I was there when she began her incredibly talented blog work, having been one of the first to ever leave her a comment on her very first post! You've come a long way since then, and while your debut was awesome, you've continued to set that bar so high that we all aspire to! Here's to many more wonderful swatches from you! (PS: you should also seriously consider marketing your delicious frankens so we can all enjoy them!). To visit Ommorphia Beauty Bar, you can either follow the link or click on the image below. Thank you for visiting girls! Wow, the matte topcoat works amazingly well with this. Looks stunning! 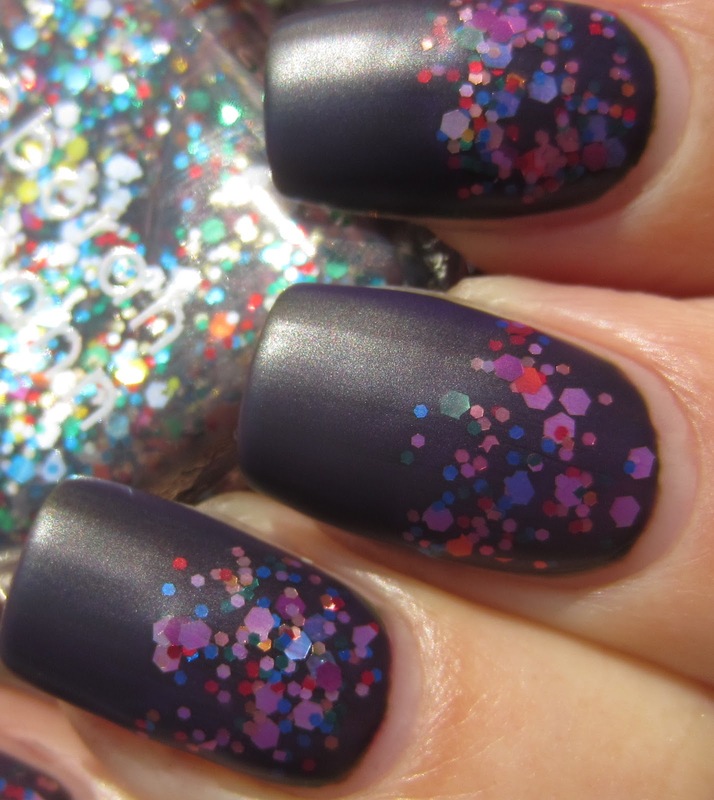 The combination of black and colorful sparkles is perfect! Love the jelly sandwich and the matte really makes the look!!! It turned out AMAZING !!! I love the mattified version so much, I am definitely keeping this post bookmarked for future visits!! Lovin it! It's perfect with the matte top coat! I love this! The matter version is my favorite. I really need to get myself some more jelly polishes to do sandwich's with all the glitters I own. This looks positively amazing! On top of that, it's not an impossible to follow probability that I can do this for myself...esp since I have all the shades you used. I never would have thought to use Call Me Irresponsible over the Billionaire and HB. That was a total wild out of the park idea that really worked so well. I could see this one both matte (as shown) and also shiny too. I HAVE to ask how the DL Rehydrating Base Coat works???? I have not used that product and frankly have looked around for a base coat that really is hydrating. Being a chemist, it needs a water locking molecule of some sort and maybe a water attracting molecule - not sure - but I know that is something I need as I will get thin, peeling (dehydrated nails after wearing polish on my fingers for a week or more - I have to about 1X/mo go on a polish hiatus and really work to get my nails back into shape. Happens to me with just about every brand of polish, but worse with shimmers/metallic - does not affect my toenails at all). Thanks for popping in and honoring us with this fab,totally wearable/interesting mani. This is gorgeous! Which matte top coat did you use? It looks more rubbery than most I've seen, I need it! It looks good. I like it with the black polish. I absolutely love the DL Rehydrating base coat and while I'm not a chemist & couldn't break it down for you, perhaps the addition of biotin and green tea in its formula are what help it to work so well. You should also consider taking a supplement high in EFA's (essential fatty acids) such as borage or rosehip seed oil to helps strenghthen your nails (helps to build keratin) - but a hiatus every so often is good too (that's what I try to do as well!) Hope this helps! I actually would up applying 2 coats of Essie's Matte About you to ensure it was fully mattified! Love this guest post- another sensational look Eugenia:) After gold, purple is the ultimate for me- so this mani is absolute bliss!! I like it shiny.. but I freaking ♥LOVE♥ it matte! Wow Euginia, what a pretty mani you did. I love the matte version the most.